I decided to start doing the EDM (Every Day Matters) drawing challenges and the first is to draw a shoe. I started with fountain pen and felt pretty good about it. Then I had the idea of using china marker as a resist for the whites and brushing over with PITT pens. You know, like brushing watercolor over crayon in school? It didn’t quite work out the way it did in my mind, as often is the case with such experiments. 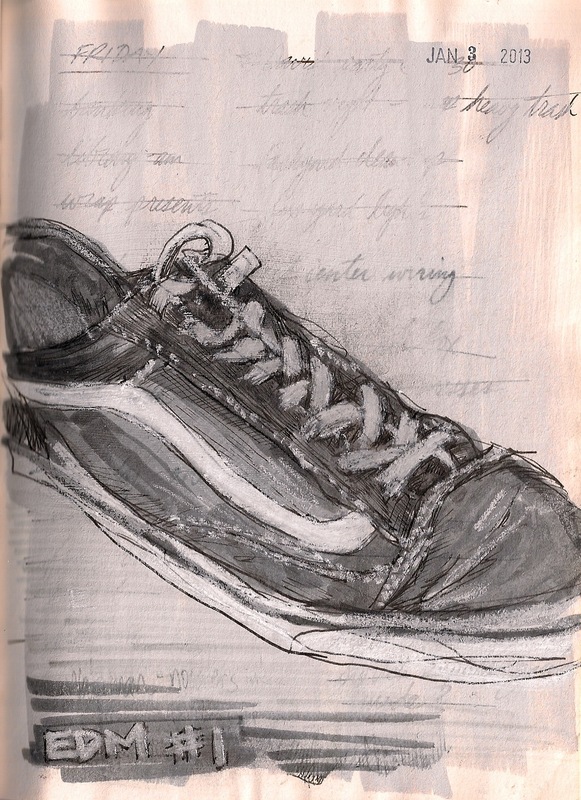 Mostly it was the laces smearing when I wiped away the excess ink. Next time I’ll have to remember: if smeary and messy is okay then the china marker is fine. If more precision is desired, then reach for the drawing gum. Still, I like it and it made me laugh. Looks like my ratty old Vans! And doing this drawing made me realize I mis-laced my right shoe. So completely embarrassing! I first read about the EDM challenges on Danny Gregory’s blog and I’m going to start with the list he has there. Check out his books if you haven’t seen them. Super good.